Take your love for musicianship, artistry and ensemble, and combine it with practical experience and intensive training to forge your future. Combine additional areas of study outside of music to build a program that will help you meet your future goals and give you career options across a broad range of fields. This program is one of the most flexible music programs allowing you to gain a wide variety of skills and knowledge. BJU’s music programs prepare you for a career in many creative fields, from arts education outreach to public relations or studio work. You’ll build a solid foundation in musical theory, history and technology. And you’ll sharpen skills in performance so you can grow as a musician and play your instrument expertly. You’ll have private study on your principal with the option of performing a senior recital. 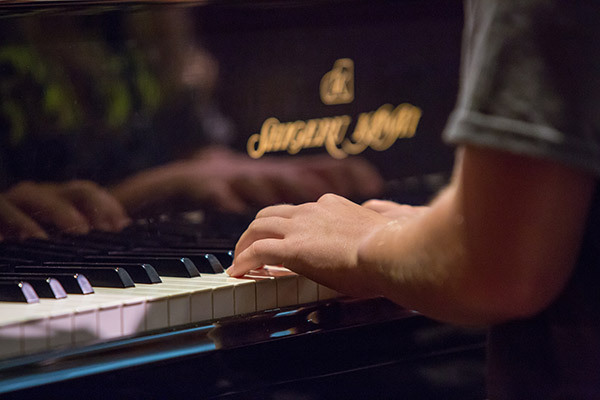 The flexible program integrates music studies with a second field of your choice. You have the option to combine your love of music with fields such as business, communications, health science, audio/video studio production, or cross-cultural studies leading to a double major. Crafted in collaboration with a faculty advisor, your program mixes musicianship with a wide variety of liberal arts options. The program culminates in an experiential learning internship with a local music industry or arts organization. The program is available as either a bachelor of science or bachelor of arts depending on the courses that you take. When you arrive for your first semester, you’ll need to audition so your music background and current skill level can be evaluated. The audition will help the music faculty assess your potential as a music student and will give them a good idea of how to equip you to reach that potential. One to three faculty members may be present for your audition. Liberal arts courses will help you develop essential life skills such as critical thinking, problem-solving, creativity and effective communication—skills necessary for flexibility in your career. The importance of communication skills cannot be overstated for a musician, and these core courses will enhance your powers of expression. In addition, your Bible courses will connect your pursuit of God to all of life. These courses will encourage you to make your relationship with God your top priority, and to view your ethics and practices in your career through God’s Word. One of the strengths of the program is the wide selection of electives available. You can use these electives to dive even deeper into your interests or take a course just for the fun of it. Popular elective courses include foreign languages, business, communication and philosophy/psychology. The music program at BJU opens the door to many career possibilities. Your internship is also an important part of your experience. You’ll be able to take the things that you are learning and use them in a real-world environment. At BJU, you’ll experience a variety of excellent performances—as a performer and as a member of the audience. You’ll grow through personal performances, large and small ensemble recitals, the Concerto and Aria Competition, annual music contests, and student recital hours. Additionally, you’ll be exposed to accomplished artists in the Concert, Opera & Drama Series, such as the King’s Singers, Canadian Brass and Prague Symphony Orchestra. BJU’s music faculty are graduates of some of America’s finest graduate schools. Many currently perform in area orchestras such as Greenville Symphony and Spartanburg Philharmonic orchestras. Perform with proficiency in a variety of musical settings and styles. Critique musical works and performances from a biblically informed understanding of creativity and aesthetics. Articulate an understanding of music as it relates to culture and human enterprise past, present and future.